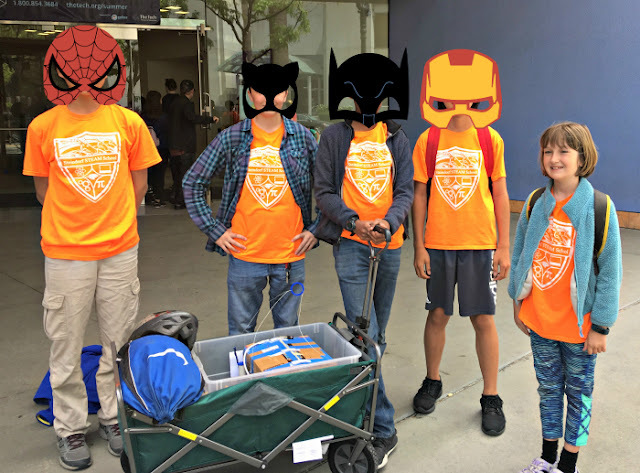 This year, Smarty teamed up with her grade mates to compete in a signature program of San Jose Museum of Innovation - The Tech Challenge. 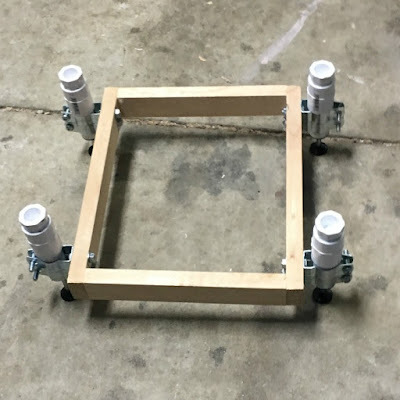 Design and build a device that can survive a drop from 10 feet and deliver a payload up the ramp. No batteries allowed! Two attempts are allowed to achieve the challenge. Each attempt is made up of two parts. Part One: Drop device from 10 feet and land in the drop zone. Part Two: Once landed, the device must deliver a payload of one U.S. penny onto a target located on a ramp. Maximum device size envelope including the lifting ring: 24" x 24" x 24" while hanging. The device must remain inside the size envelope until dropped. Maximum device weight: 3 pounds. Payload: One unmodified U.S. penny. Penny must be plainly visible when the device stops without disassembly of device. No sharp edges are allowed. Smarty eagerly signed up for this challenge when it was announced. Her school has 1 hour a week allocated as an Innovation Hour with the idea that kids can work on their "passion projects" during that time. She was thinking that she would have an awesome team, that they would come up with a brilliant idea immediately and that her team would build their device during Innovation Hour time working one hour a week. Nothing could have been further from the truth. For once, parent advisers were in charge of grouping kids, and Smarty was disappointed with both group composition and with her group's parent adviser who was neither a good project manager nor a knowledgeable engineer. However, Mrs. S was persistent. 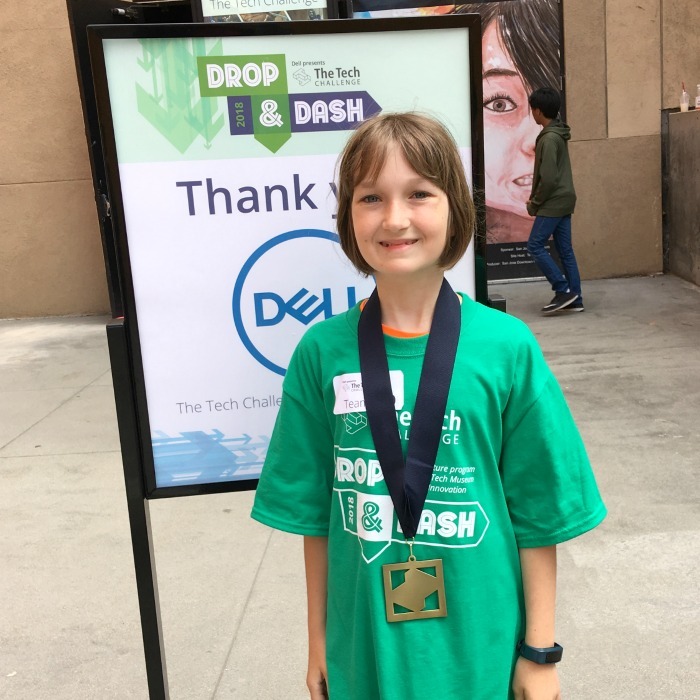 She immediately set up a weekly 2-hour Saturday meetup at her house to work on the Tech Challenge. However, the kids struggled to work together - they were not really friends outside of school and had little in common. Smarty would come home grumpy and upset with what she called "an immature behavior" of her grade mates. Basically, the group was stuck in the "storming" phase of group behavior, the clock was ticking and only feeble attempts at the prototype were made. In February, Smarty's adviser asked me to help out, because the group was not making any progress. Instead, I asked my husband if he would be willing to help. Now, my husband is extremely creative and he loves to build things. In fact, he was more intrigued by the challenge from the beginning than Smarty ever was. He agreed to consult the team. He started his first meeting by telling kids point-blank that they should quit the project if they are not able to commit to it. Nobody wanted to do that. Then they brainstormed the solution and agreed that it will have three parts - a lander, a delivery vehicle, and some sort of a mechanism to power the vehicle. My husband broke the useless "we'll do it together" cycle and asked kids to take direct responsibility for one part of the project. Smarty volunteered to build the lander, two boys raised their hands to build a vehicle, and another girl and a boy both agreed to investigate the engine. Smarty envisioned some sort of a shock absorbing mechanism for her lander and actually did a decent amount of research into options. Her Dad helped a lot with details and guided her through several iterations of shock absorbers including devices that released energy through corks popping out of them, oobleck shock absorbers which, to Smarty's and her Dad's joint surprise, did not work at all, and eventually to these water-based shock absorbers (there is water inside those tubes). To be honest, there would be no way that Smarty would have done all this work on her own, but she stuck with it not wanting to disappoint her Dad. One of Smarty's grade mates, a quiet Korean boy who just relocated to US in the middle of the last year really stepped up once he was released from "doing everything together" approach. 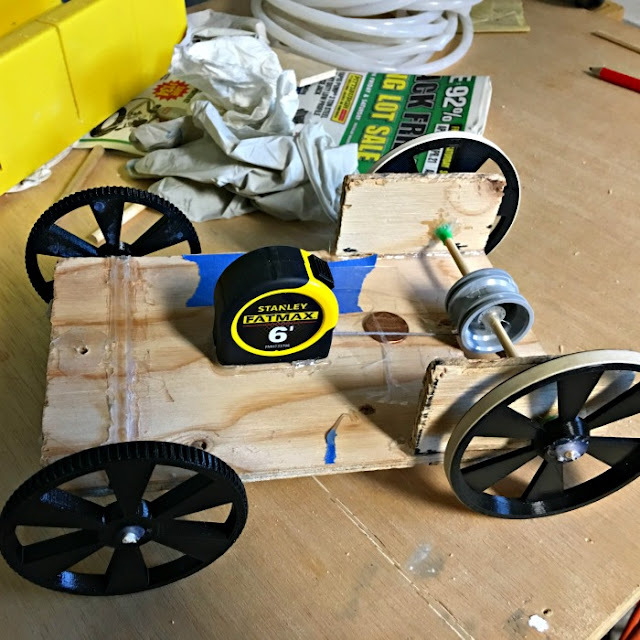 He built the first prototype of this tape-measure driven car, plus a box with an opening mechanism that would release the car on landing. Smarty contributed to the car by designing and 3D-printing these cool-looking wheels. A lander plus a delivery vehicle ended up being too heavy - a lander needed to be redesigned quite a bit to lose its wooden frame and attach directly to the cardboard box. The car would not drive straight, Smarty and another teammate had to rebuild it from scratch. The opening mechanism was not reliable, my husband guided the team designing it to the solution that actually worked. Everyone was super excited and apprehensive on the Tech Challenge day. I was blown away with how well this event was organized - hundreds of teams went through a "conveyor belt" of having their device weighed and measured, showing their engineering journal that counted as 30% of the grade, having a lengthy interview with judges about their device (another 30%), and finally proceeding to the demonstration stage of a fairly large arena where 10 hoisting cranes could accommodate 10 teams at the same time. Everything was captured on cameras and the drops were shown on the big screen. Poor Smarty was totally over-stimulated, and she was not the only one. The kids were so frazzled that they set up their device backwards on the first attempt. It worked perfectly, but the car went in the opposite direction :) Luckily, every team was allowed two attempts to make it work. They corrected their mistake, and on the second attempt their lander dropped exactly in the landing zone, their car zoomed out of the box and delivered payload just where it was supposed to. It was really something remarkable - to see how so many months of effort paid off. Once the presentation part was over, kids could enjoy a free entrance to a Tech Museum. We had an hour to kill before awards ceremony that they all wanted to attend. Again, awards were also extremely well organized - everyone got a medal, but not everyone got an additional award. Smarty and her team desperately hoped that they will get that extra recognition and... they did. Their team won one of the three award in the prestigious category of Outstanding Engineering Process. They had to come on stage, shake hands with presenters, have an additional picture taken, and receive their prizes (tickets to a local water park). The exhausting and at times frustrating process came to a very happy end. When Smarty was getting ready for bed that day, I asked her, "So, if your new school participates next year, would you want to be on a team?" She said, "Ask me again in a few days - when I forget how excited and happy I was today and remember how miserable I was for months and months." I think that she did learn a valuable lesson here - to be more mindful of what it means to commit to a long team project and to really weigh her true interest against the impulse of be in competition regardless of what the competition is about. I also hope that she learned a lesson in perseverance and improving her design to the point of not just "doing something" but doing something that actually works. What are your children building lately? We went to see the Tech Challenge last year since one of our friends was in it. I have mixed feelings about the event just as I do with science fairs. 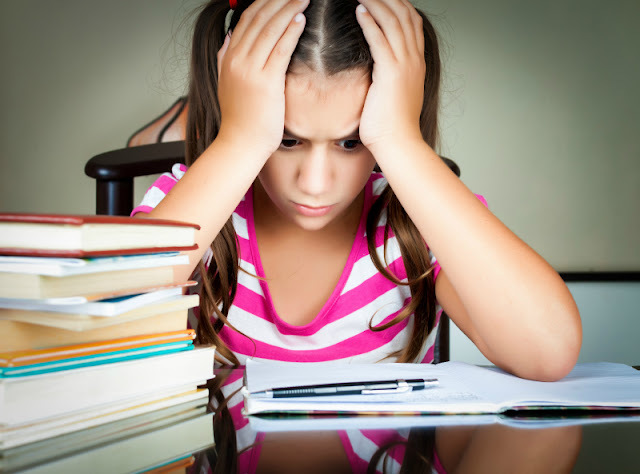 Personally, there's too much hype and while competition is good, in this case, it is not fair due to parents helping out. I would prefer this done during class time with the focus on the process rather than the product. For example, have a specific goal and then have the students have a go at it. Then have regular group meetings to discuss what worked and what didn't and how to improve. After that, kids can go back and keep working but the goal is to learn the joy of struggling to find a solution rather than a medal. Our district hired a new Innovation leader. I'm curious to see what this person will implement. In K's robotics class, the teacher assigns specific tasks and the groups work on meeting those tasks. In this way, it's not such a huge project and they can focus on the skills. So far, she's been happy with the kids she was grouped with because the teacher let the students try working with different students on the first day. If they work well together, they were placed in the same group. The only competition seems to derive from which groups completes the task quickly and efficiently. K is happy that her group is able to complete more than one task during each session. My kids are busy making crafts to sell at a market right now. They are learning a lot about what will sell and what will not! That does show a lot of thinking to not give an answer right away on whether she wants to build it again. I find this whole competition and how it was approached fascinating.